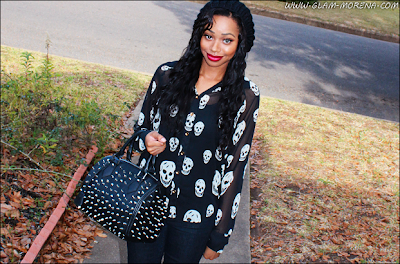 Glam Morena: Outfit Of The Day: Skulls, Spikes, Studs & Giveaway. 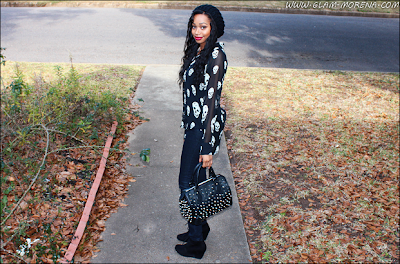 Outfit Of The Day: Skulls, Spikes, Studs & Giveaway. 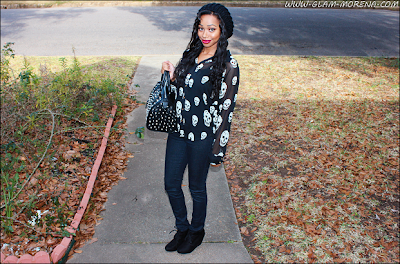 I wanted to post an outfit with my new favorite handbag from Bag Inc. It's the Melrose Glam Chaos Studs And Spikes Leather Bag in Black. This outfit is a bit more on the edgier side, but still very laid back. Don't forget to scroll down to find out how you can win this handbag too! 1 subscriber will win the handbag mentioned up above! This giveaway is opened internationally. Go here to submit your entry. Love the look and the bag is HOTT!